Product categories of Lever Hoist, we are specialized manufacturers from China, Lever Hoist 1 Ton , Harrington Lever Hoist suppliers/factory, wholesale high-quality products of Jet Lever Hoist R & D and manufacturing, we have the perfect after-sales service and technical support. Look forward to your cooperation! The lever hoist with tight structure and graceful outline and its weight is light. People can operate it easily even in narrow place. High elastic spring with double pawl brake system design featuring stable operation and smooth braking. 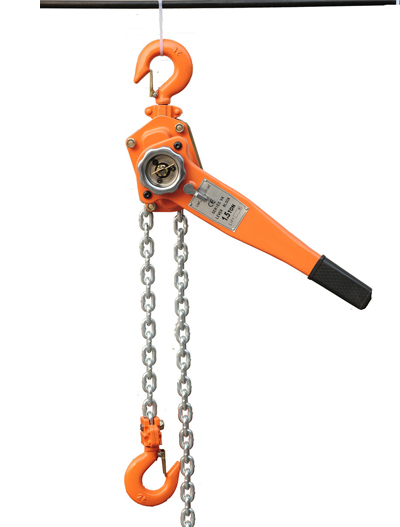 We design sealed guide Chain construction to ensure the load chain running safely. The top and bottom hook are made of forged high strength alloy, accomplished by heat treatment process. The hooks also have three stretch indicators. However if by any chance the hook is overloaded there is no fear of it breaking, it will simply gradually start straightening out, avoiding any load drop or personal injury. Within auto-clutch,worker can handle the load chain with one hand when there is No-Load. Precision cast steel latch in bottom hook with embedded design can prevent the bottom hook off effectively. Every Huaige brand hoist individually proof load teat to 1.5WLL with individual serial number. MBL of 400% of WLL. If the handle is locked under a shock load, the lock-releasing mechanism acts to set the handle free to move. What is our factory product range? Hydraulic Jack, Forklift, mini crane, etc. 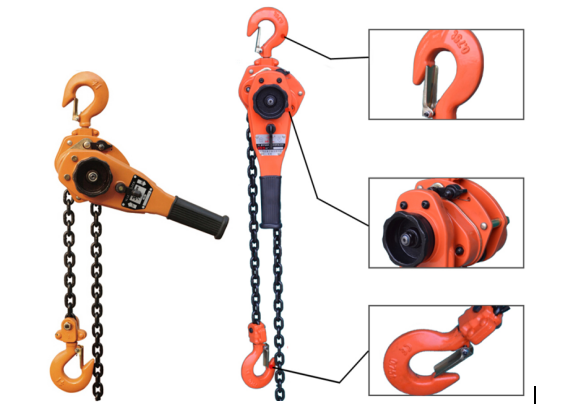 2) Hoist Accessories: Load chain, wire rope, rigging, hook ,pulley and shackles. Send the inquiry with detail item description or with ITEM number. Tell us the quantity you need, the size of goods, and the packing. If there is no packing demand we take it as seaway packing. If possible please attach one reference picture to avoid any misunderstanding or any links from our website for we get a better understanding. Cost with free if the quantity small, and the express charge account into buyer`s. T/T, LC in U.S. Dollars or EUR, for small orders, PayPal is ok.
usually within 35-40 days after receipt of your deposit. Usually shipped by sea, small order or urgent order can by air or by courier after received your agreement. According the distance from China to your port. Usually from China to European about 22 days. To West of American 20 days. To Asia 7 days or more. To Middle East more 30 days. By air or by courier will be faster, within 7 days. Different products with different limited, please contact us to confirm. YANFEI QC department will teset products before shipping. We have 100% quality guarantee to customers. We will be responsible for any quality problem. What's benefit will you bring?